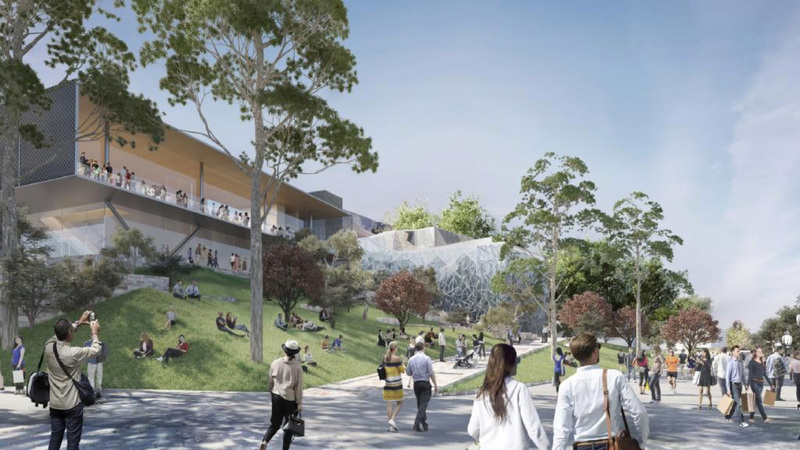 Frequent Apple collaborator Foster + Partners has gone back to the drawing board for their plans to build a flagship Apple store in Melbourne, Australia’s Federation Square. The original scheme was unveiled back in December of last year, and the public pushed back over the location, the “Pizza Hut pagoda” design, and the potential demolition of the Yarra Building. Federation Square spans nearly eight acres and serves as Melbourne’s main public square, the result of a government-mandated reclamation of the industrial land on the banks of the Yarra River in 1999. The architectural design competition for the square was won by a coalition of teams including Lab Architecture Studio, led by Donald Bates, Karres en Brands Landscape Architects, and the local firm Bates Smart. Donald Bates is acting in an advisory role for the proposed Apple store project. 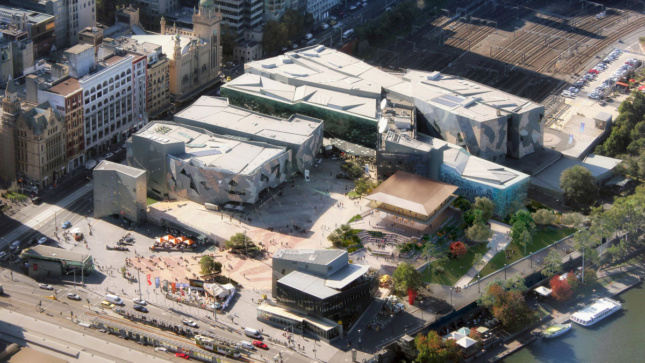 The original Federation Square design includes an eclectic collection of three-story buildings organized around a central plaza. Each building is clad in zinc, glass, and sandstone, often in a seemingly-random, fractalized pattern. The square contains a number of cultural resources, including the Ian Potter Centre for Australian art, and the Koorie Heritage Trust in the Yarra Building. The group responsible for maintaining the square, Fed Square Pty Ltd, has been quick to point out that the area has always had private retailers, and that the square operates on a commercial model. 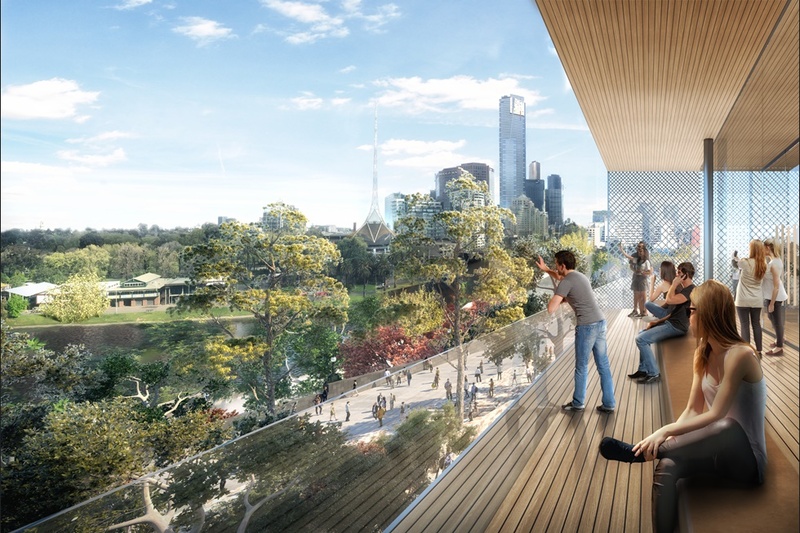 Foster + Partners’ original plan for Apple Federation Square would have replaced the three-story Yarra Building with a two-story glass “pagoda” meant to open up views of the river. The glass cube would have been enlivened by two bronze skirts, resembling a double-height version of Foster’s flagship store in Chicago. After Melbourne residents took to the internet, local council meetings, and workshops to protest, a steering committee was set up to gather input on what the public would like to see included. The revised building takes the aforementioned concerns into account and attempts to better engage the existing buildings in the square and the landscaped river to the south. The new building is much blockier and top-heavy than its previous iteration. The large rectangular top half seems to levitate when viewed from above as it cantilevers off of a smaller base and creates space for an array of rooftop solar panels. The change includes a public balcony overlooking the river and over 5,300 square feet of public space. Still, these changes aren’t enough for those who feel an Apple store is the wrong choice for Federation Square, full stop. The group Citizens for Melbourne is vowing to fight the addition, arguing that Foster + Partners have simply swapped a “Pizza Hut pagoda” for an “iPad”. 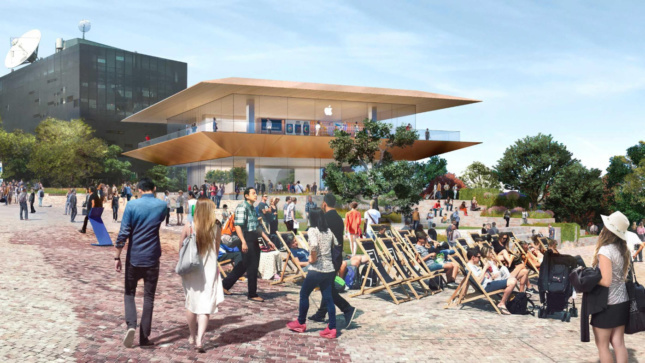 If construction continues as planned, Apple Federation Square will open in 2020. Demolition on the Yarra Building is slated for 2019.